WEIGHT LOSS TIP: Did you know that many of the most commonly prescribed drugs cause weight gain as a side effect which can have a huge negative impact upon you when you are trying to lose weight? Unfortunately few people are aware of this fact but it is something that you better be aware of if you are ever going to have any success at weight loss. Some of the most notorious prescription drugs that cause weight gain are anti-depressants and many birth control medications but a large percentage of the most commonly prescribed drugs also list weight gain as a side effect. Many people faithfully use these types of prescription drugs believing that they are taking them to improve their health when in reality they are destroying their health by gaining huge amounts of extra weight which leads to health problems like high blood pressure, high cholesterol, diabetes to name just a few of the common health problems caused by being overweight. Whether it is a coincidence or not the rate of increase in obesity in America over the last thirty years mirrors closely the increase in the use of prescription medication over the same period of time and author Ben D. Kennedy in his book Why Is America So FAT? believes it is a big part of what is fueling the whole American obesity epidemic.1 The negative effect of weight gain caused by prescription drugs can be so bad that even a perfect diet and intense exercise may not be enough to overcome this terrible side effect. If you have been doing "everything right" by eating healthy and by exercising regularly and you have still not been able to lose any weight then chances are you are using a prescription medication that causes weight gain as a side effect and this is what is keeping you from successfully being able to lose weight. Start questioning your Doctor or Pharmacist about the medications you are using and either get them to prescribe you medication that does not cause weight gain as a side effect or find a natural alternative for whatever your health problem is that requires medication because avoiding drugs that cause weight gain is too important to your health and to your success at losing weight. 1Kennedy B. 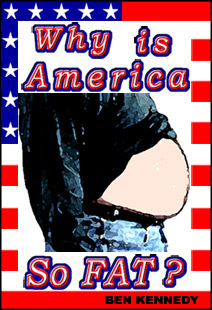 Why Is America So FAT?. Louisville: RLK Press, 2004.